New Photos! On Saturday November 26, clergy and parishioners of St. John Chrysostom Church in Grand Rapids, Michigan prayerfully commemorated the centennial anniversary of the parish's founding as well as its patronal feastday. On November 23, His Beatitude Metropolitan Tikhon of all America and Canada, along with the delegation from the Orthodox Church in America departed Moscow. 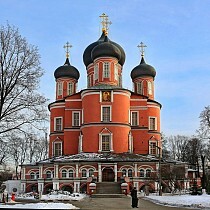 On Saturday, November 19, the Primate of the Orthodox Church in America, His Beatitude Tikhon, Metropolitan of all America and Canada led the Divine Liturgy in St. Catherine Representation Church in Moscow. 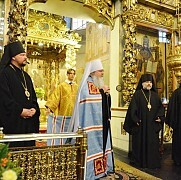 On November 18, after meeting with His Holiness Patriarch Kirill of Moscow and all Russia, the delegation from the Orthodox Church in America visited Donskoy Monastery and celebrated a Moleben before the Holy Relics of St. Tikhon, Patriarch of Moscow and all Russia. 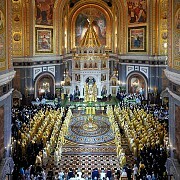 On Sunday November 20, the Administrator of the Patriarchal Parishes in the USA, His Grace Bishop John of Naro-Fominsk attended the Divine Liturgy in Christ the Savior Cathedral in Moscow honoring His Holiness Patriarch Kirill's seventieth birthday. 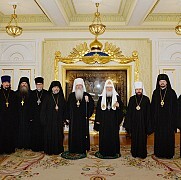 On Friday, November 18, His Holiness Patriarch Kirill of Moscow and all Russia met with the Primate of the Orthodox Church in America, His Beatitude Metropolitan Tikhon of all America and Canada at the Patriarchal Residence in Danilov Monastery in Moscow. On Friday, November 18, the Primate of the Orthodox Church in American, His Beatitude Metropolitan Tikhon of All America and Canada arrived in Moscow to take part in the celebrations of the 70th birthday of His Holiness Patriarch Kirill of Moscow and All Russia. On Sunday, November 13, the Administrator of the Patriarchal Parishes in the USA, His Grace Bishop John of Naro-Fominsk led the Divine Liturgy in St. Michael the Archangel Church. 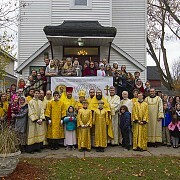 On Saturday, November 12, the Administrator of the Patriarchal Parishes in the USA, His Grace Bishop John of Naro-Fominsk celebrated the Divine Liturgy in St. Innocent Church in Redford, MI. 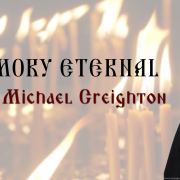 Updated: On Monday, November 14, Deacon Michael Creighton, cleric of the Church of the Kazan Icon of the Mother of God in San Diego, CA reposed in the Lord. 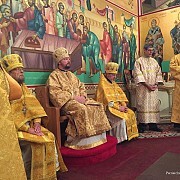 On Sunday, November 6, on the feast of the Icon of the Mother of God "Joy of all who Sorrow", the Episcopal Consecration of Archimandrite Irenei (Steenberg) as Bishop of Sacramento, Vicar of the Western American Diocese of the Russian Church Abroad was held in the cathedral of the Mother of God "Joy of all who Sorrow" in San Francisco, California. 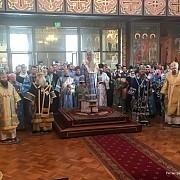 On Friday, November 4, the Administrator of the Patriarchal Parishes in the USA, His Grace Bishop John of Naro-Fominsk led the Divine Liturgy in St. Nicholas Cathedral for the feast of the Kazan Icon of the Mother of God. 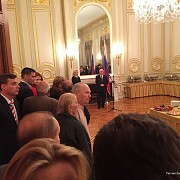 On Thursday evening, November 3, at the invitation of the Consul General of the Russian Federation in New York, Igor Leonidovich Golubovsky, the Administrator of the Patriarchal Parishes in the USA, His Grace Bishop John of Naro-Fominsk attended a reception in honor of the Russian civil holiday, "Day of National Unity."